In a small bowl combine the olive oil spread, parsley, pepper, and Cajun seasoning until mixed well. Cover and chill until ready to serve. 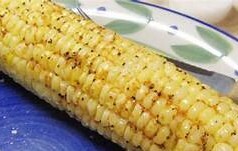 Serve with corn on the cob, other veggies, etc. Suggestion: On a sheet of waxed paper, roll the mixture into a 1-inch diameter roll. Wrap in waxed paper and chill for about 4 hours until firm before slicing into serving slices.